Siberian Larch is an incredibly hardy tree which is native to the cold Siberian regions of Western Russia. Builders in the UK have tapped into the durable qualities of this wood for many uses, such as shingles, shakes and more recently larch cladding. 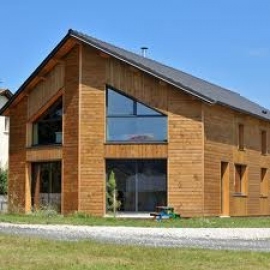 Siberian Larch Cladding originates from one of the coldest and most inhospitable regions of Europe. The larch tree has evolved over the years of harsh winters to withstand this type of extreme environment, which is why larch cladding has such great insulation properties. Also as a result of the cold weather, larch trees grow very slowly, resulting in tight growth rings and a very dense wood. To withstand the winters, the wood has to be incredibly hard, making it one of the most durable softwoods available in the world today.Larch cladding is almost 100% impact resistant and will create a durable surface which will last for decades if properly maintained. One of the amazing things about Siberian Larch is that it is actually naturally rot resistant. The resins and chemicals present in the wood act as an antiseptic, which repels insects. This is why, unlike other woods, it can be used without chemical treatments such as paints and stains. When it comes to aesthetics, many people are attracted to the pleasant warm colour of Siberian larch. The wood can vary in colour from a creamy yellow to a light brown. It can be stained or painted if this is the desired effect. Like cedar, if left unstained larch cladding will weather to an attractive silver grey colour within two to three years. Siberian Larch is sourced from well managed forests. The amount of Larch that naturally grows in Siberia accounts for nearly 38% of the entire Russian Boreal forest. To put this in perspective, this is an area larger than the entire Amazon Rain Forest. For every tree that is cut, the equivalent of five more have already planted in its place, making Siberian Larch a sustainable choice. The Forest Stewardship Council (FSC) oversees the production of Siberian Larch and awards certificates to companies who use sustainable wood, so when choosing a company to supply your larch cladding, be sure to ask about FSC. From the frozen Siberian forests to your building, Larch is an impressive tree with many useful qualities and is an excellent choice for exterior cladding.